The name came into my head when I took the leftover Brussels sprouts out of the fridge with a view to frying them up for lunch today. Bubble and Squeak--named for the noise they make in the pan while cooking. Ho-hum–I didn’t hear a thing! Wasn’t this quaintly-named concoction part of my mother’s post Christmas leftover strategy? Dishes to go with cold turkey that only needed heating up? Then a memory of added bacon floated into my mind. Didn’t bacon get mixed into the brussels? 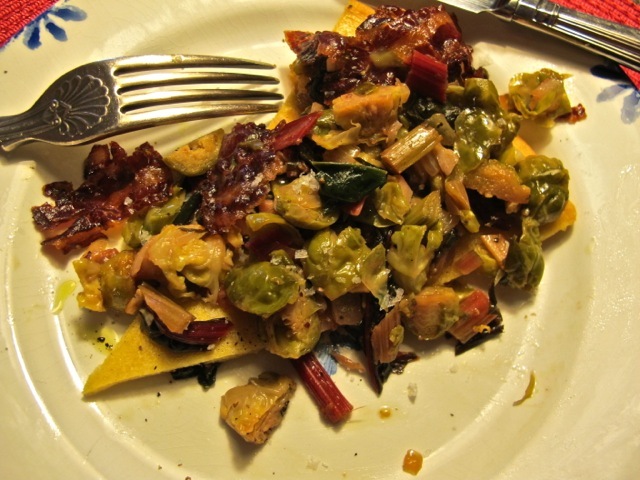 Well, bacon bits were already part of the feast on Christmas day–no harm in adding even more oven-crisped smoked bacon to the fried-up sprouts…. They’ll go nicely with a slice of the chickpea (socca) bread cooked in the oven as well. Add a poached/fried egg and “Bob’s your uncle”–to revive another phrase from my childhood. 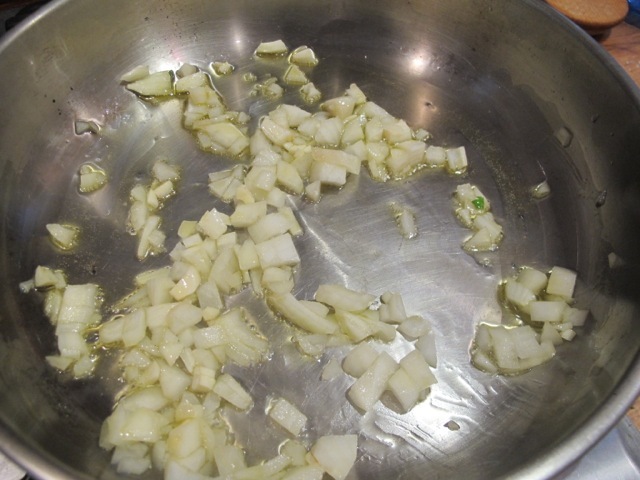 Heat a couple of tablespoons of olive oil in a sauté pan and add the onion and garlic. 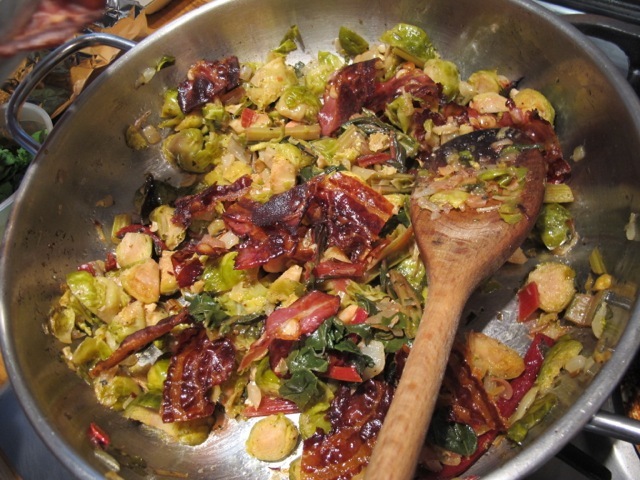 Let them color a little before adding the brussels and the swiss chard (or other leftovers). Mix together and cook gently for about 10 minutes–just long enough to heat them through. Cook the bacon separately to a crisp state and scatter broken up bit over the sprouts. 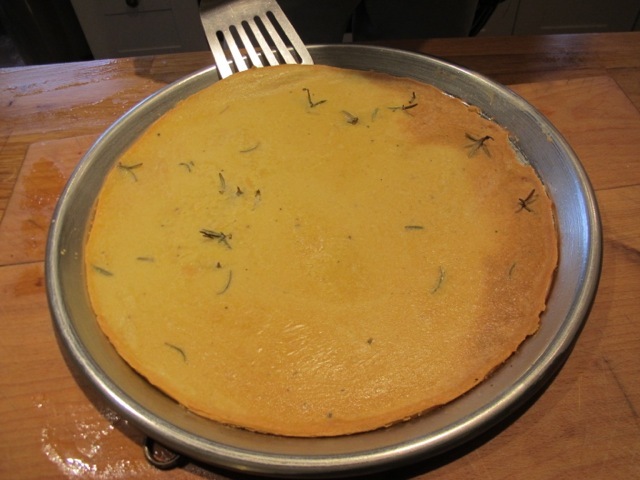 We enjoyed it on a slice of the homemade socca–chickpea flour–bread. And the only sound was “umm”! Mmmm. Good! I remember “Bubble and Squeak” from my life in London. Sausages, greens, onion and potato, it made plenty of noise. Thanks, Robin! Have not heard of this combination before. Sounds good! Will try it. I bake a simple bread recipe which should go nicely. Happy New Year! Bacon goes with everything and Brussel sprouts are the vegie of the season! Yummy will try it for New Years..baking stuffed shells today. Hope your Christmas was just what you wanted and a Happy Healthy New Year is on it’s way. ..and that is sent to Meredith as well. love the photos. Barb S.
Mmm! 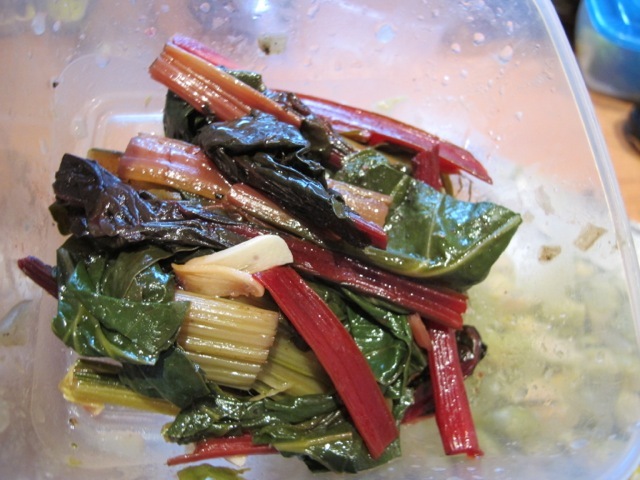 Sounds good–we love swiss chard & onions! We are currently making omelets with the our leftover Christmas ham (and broccoli). This year I tried something new to the side dish of carrots: added some apple cider, cinnamon, and chopped apples (along with a bit of butter). Had it in a restaurant recently; not bad. Was even better with reheating, though. Happy cooking! Happy cooking to you too in 2015, Dianne. Enjoy your bubble & squeak. Looks very tasty. How do you make ‘Socca Bread’ & what is it? I have not come across this recipe but it looks nice & tasty. Thanks Diane–click on “chickpea bread” in the post and it should lead you to the recipe. In my own family Bubble and Squeak was made from leftover potatoes and Brussels Sprouts. They were mixed together and cooked in bacon fat. A plate, that fitted inside the pan, was placed on top of the mixture and when a good brown crust had formed and the mixture heated through, the pan was inverted and it could be cut into portions and served from the plate. If you especially liked the crust, you could reintroduce the mixture to the pan with the crust now on top. You didn’t put the plate back on as the steam produced while cooking would soften the crust on top. When browned on the bottom you would slide it onto a plate and serve. It was delicious. I seem to remember that it got it’s name from one of the ingredients making bubbling sound during the cooking while the other woyld squeak. 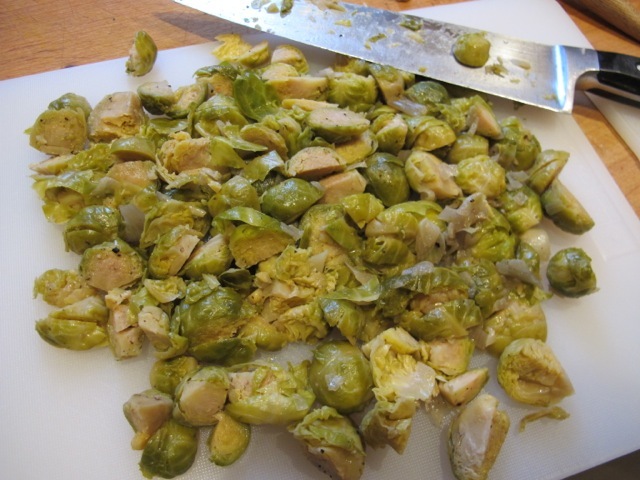 Also made at other times of the year replacing the Sprouts with various other green leafed vegetables. Lovely description, Steven, thank you. for Christmas every year but this might make a great side dish to that, especially with the Swiss chard. I can actually purchase a mix of chard, kale,,and bok choy prepackaged in our local stores here in the states. Always make with turkey bacon and some type of onion to partner with fish. on December 27, 2014 at 6:48 pm | Reply Shelagh in Vermont. Fiona is correct. A favourite childhood meal for me – leftover cabbage & taters, fried together in butter (undoubtedly marge in WWII tho). Now I add chopped garlic, onions, bacon, lots of coarse-ground black pepper, Himalyan salt, and anything suitable found in the fridge. Yum. My uncle john brought bubble and squeak into our lives… It was the leftover corned beef and cabbage with a few of the potatoes and carrots tossed in too, I suppose! It did make a distinctive sound. I love bubble and squeak and especially the name! Just found kale sprouts today! Trader Joe’s! The very best of everything in 2015 to both you and Meridith. Keep the stories coming! I think the fundamental elements of Bubble and Squeak are cold roast potatoes and brassica – i.e.cabbage or brussels. Cooked in the fat of the meat on the day aftr a roast. Like a puppy, this recipe is not just for Christmas. Named more for the after effect than the sound of cooking. Authentic food from post-war rationing days. You are right Chris–it all comes back to me. The roast pots are delicious–no good for me though. Wonderful Recipe Robin. However I have always wondered on the origin of the phrase “And Bob’s your uncle”. It’s a distinctly English phrase yes? Any idea of origin? Wiki answer, Maureen, but beware–see last sentence! The link here between an uncle Bob who was Prime Minister and a ‘Bob’s your uncle’ passport to a cushy life is easy to make.The fact that the word ‘nepotism’ derives from ‘nephew’ makes the link seem all the more neat. Such neatness is often the mark of a back-formation, that is, an explanation that is made up after the event. Ah ha! Thank you! Most interesting! Love word and phrase origins.